Nostalgic moment, coz that photo was taken in Newcastle. And yes, L'Oreal should send me a gift...hehe! Please note that this is just what I did, and I'm sure there are much better ways to do it. Also, the same colors may not turn out the same for your hair. Results will vary depending on hair types. Hair Color 1 : L'Oreal Excellence Crème 8.1 Natural Ash Blonde ~ This was my base color, before I decided to go ombré. It came out at least 2 shades darker than the model's hair. Hair Color 2 : (Ombré) L'Oreal Preference Wild Ombrés 3 ~ This is an ombre kit that comes with a comb brush that made it quite easy to color only the tips. You squeeze the cream on it, and then comb it through the ends of your hair from chin down. To give the color a gradient effect & avoid an obvious line where the ombré begins, you simply backcomb upwards. 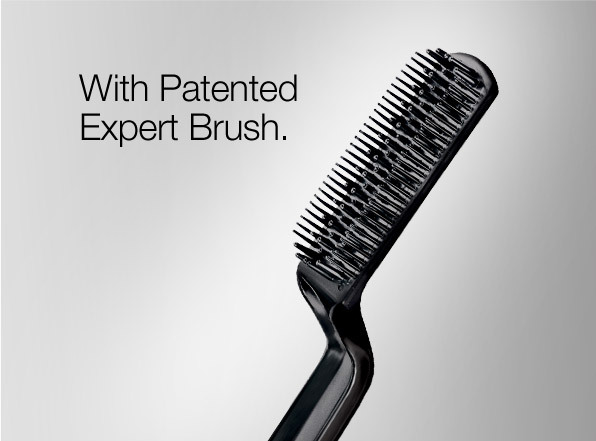 If you're using a regular hair coloring brush, try to do the same. I think a toothbrush would work well for this method, too. But it came out too orange, as you can see. That's my least favorite hair color on me, and I was horrified! *TIP: If you're going to use this kit, don't leave it on for too long. Keep checking it. If you see that it's made your hair a light ash brown, wash it off ASAP! Because within seconds, it will strip off all the brown pigment in your hair and reveal the underlying orange. It's what happened to me, it looked fine when I checked in between. Although I clicked when my hair was still wet (because it was getting dark), you can make out my hair's still orange and didn't change much. I think this works only on hair that's already very light. *Therefore, an unnecessary step. Hair Color 4 : L'Oreal Sublime Mousse 600 Pure Light Brown ~ In the end, I turned to old faithful light brown, and the orange turned a light ash brown. I applied this all over my hair, as well. I was not impressed with the 'mousse' , because it's more watery than mousse-ey (It's not all all like the Liese Bubble Hair Color) but I was happy that it toned down the orange. In the end, I was quite happy with the results, and even though the L'Oreal Wild Ombré kit gave me a brassy orange headache, it was what made the ombré possible. If I had to it all over again: I think I would use the Ombré kit first, and then use the 1st base color L'Oreal Excellence Creme 8.1 (or a 7.1) all over. I think. When hair turns orange: I won't use warm colors, like shade numbers with .3 (golden), .5 (red), .4 (copper), as they'll add more warmth. I'll stick to natural colors, like shade numbers with a whole number, like a 6 (light brown) or 7 (dark blonde) OR cool-toned colors with .1 (ash/green). I would also use something blue-toned, like .2 (blue/violet), to neutralize the golden orange (blue is opposite orange in the color wheel). But then again, even hair coloring is an art, and to get it right means the right mixture of this & that. Correcting colors don't all come in at-home box hair colors, that's why people still go to salons. WOW. I've bought a red kit & blonde kit in january. i'm still being a chicken! but you rock it to the T!!! errrrr sorry, this is Bee... I guess I logged in the wrong acct..
Oh this is really pretty! i wanna try the ombre! Looks great! Hi love da way u hav colored ur hair. i want to colour my hair too but not sure wic colour to use. u hav done it brilliantly by da way. Depends on your skin tone. Loved Your Ombre Hair! And, That Head Band is Wow! The end result looks gorgeous Cynthia! I have the experience of coloring my hair for 3-4 years (Red, Brown, Blue!) and my hair turns very much lifeless after coloring. Have not colored my hair for a long time now. This looks great on you! Finally you got your ombre hair that you have been craving for so long :D.
Where do i buy the ombre hair color?